Since we kept talking about our latest SLAM technology and telling you how it works in theory, we felt like we owe it to you to show you how great it actually works in real life. Thus, starting with Indoor Navigation for Revolver ApS, we would like to kick off a new series of blog posts about happy customers using our SLAM technology for radio-mapping their indoor venues. Revolver ApS, together with STRØM WORKS, developed the Revolver Trade Show App for one of their two annual International Fashion Trade Shows in Copenhagen’s Meatpacking District, held in February and August. It is available for iOS and Android phones and has the indoo.rs SDK integrated, to enable visitors of the show to pinpoint their position and navigate around the large-scale exhibition. The exhibition venue was about 8.000sqm and spread across two buildings, where 300 different brands were showcasing their latest fashion collections. In the pictures below you can see all the brands listed in the app as well as the distance between the user and the brands’ booths. 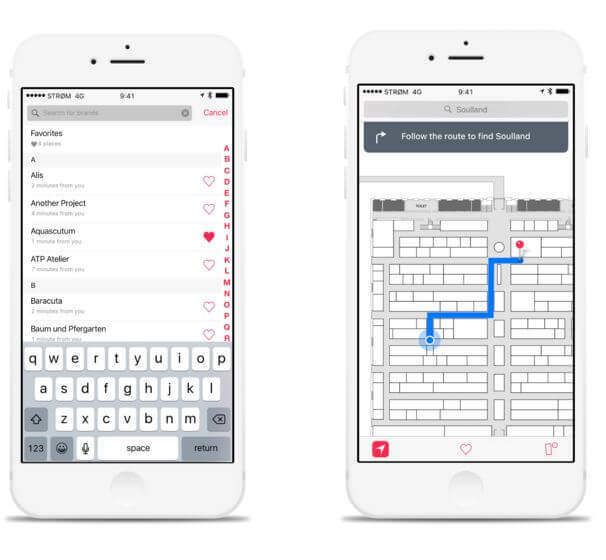 The screenshot on the right side shows the routing feature, i.e. the user’s location and the route to get to his desired location (in this case Soulland’s booth). Two of our indoo.rs teammates were busy preparing the indoo.rs setup on-site to enable the localization and navigation at the show. All in all, they deployed about 300 Beacons across four floors inside the building. For the mapping process, the new indoo.rs SLAM Engine™ came into action, with which 75 recordings were collected. What once would have taken several employees multiple days to implement, considering the size of the exhibition hall, could now be accomplished in less than one working day, all thanks to the SLAM technology’s fast data processing (and of course our colleagues praiseworthy commitment). “Working in collaboration with indoo.rs for the underlying navigation and location infrastructure has been a great experience. Along with on-site engineers from indoo.rs, we covered over 8.000 sqm, 4 floors and 300 brands, in an extremely short time frame. We’ve been immensely impressed by the ease, speed and accuracy of the indoo.rs SLAM engine, which resulted in the most precise localization of users that we’ve experienced so far”, says Carl Emil Bregnhoi, Client Services Director of STRØM. Excited to hear from our next happy customer? Stay tuned! Revolver App by STRØM from STRØM WORKS on Vimeo.